Scaffolding can be as simple as one plank secured between two ladders. Conversely, it may be as complicated as an erector-set-like structure (composed of wood, metal and steel or aluminum tubing). 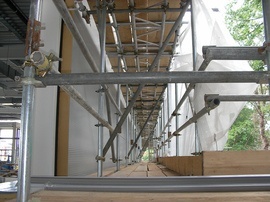 Professionals typically have their own scaffolding. For DIY projects, scaffolding may be rented for $15 to $50 a day or $40 to $150 a week. These costs depend on the size/type of scaffolding as well as your geographical location.